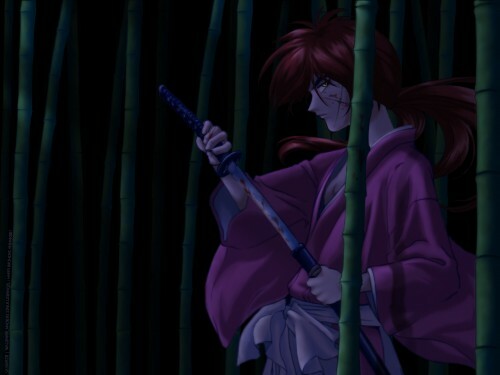 Rurouni Kenshin Wallpaper: .la morte. 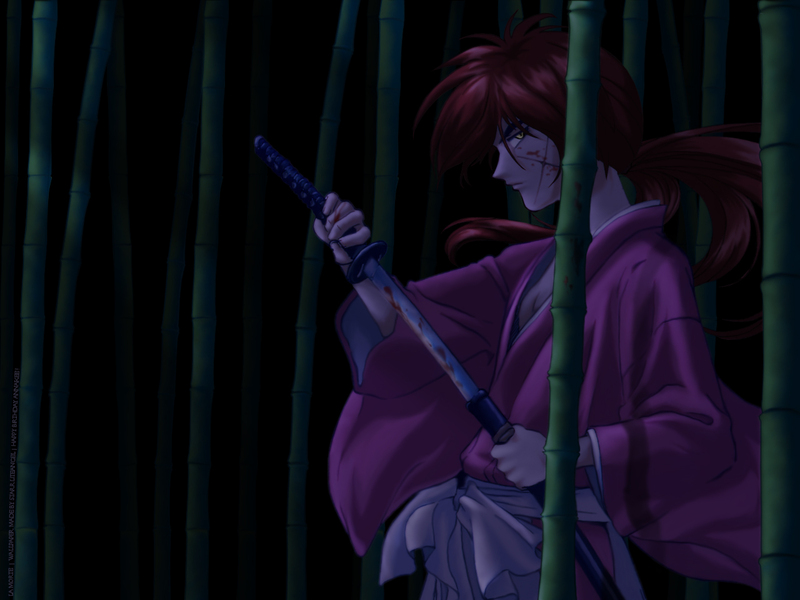 Minitokyo »	Rurouni Kenshin Wallpapers » Rurouni Kenshin Wallpaper: .la morte. Entry for the Paint-o-rama contest & present for Annakee's birthday! isnt lovely how i always procrastinate and never finish till a couple hours before the deadline? well, another simple wall again. It was supposed to be an UN-simple wall, but i dont know...now that i did one simple wall, it seems like im stuck on them or something. Hmm...well, maybe its technically not a simple wall...but it looks really really plain to me. I think its the nothing-ness in the bg. I have no clue what painting is, or how to paint. I just did what I thought looked like painting...and well, kept on going. ehhehe :nya: Sooooo I hope this looks somewhat suspiciously painted. No stock photos were used or modified...the bamboo was all done from scratch. and I think it looks pretty good considering that I have no clue what the heck bamboo looks like. I looked at a couple stock photos just for some ideas on shape and color, but other than that, it was all from my widdle brain. Kenshin is actually the scan that i modified using the smudge tool (but no filters....). ALOT of smudge tool, and some blur tool. Basically, if you took out the smudge tool and blur tool things, there would be no wall left. Practically everything was made with the smudge tool, blur tool, and soft round brush. No matter how hard you look on the net you wont find the exact scan i used though! You might find the pose, but I completely changed his hairstyle (the ponytail part), vectored the scalp hair (because the color didnt match the new ponytail), and changed his eye from nice kenshin to battousai kenshin. To tell you the truth, I like battousai kenshin better. ^-^ MUCH hawter. teehee. Lacus and I had a theme going on :D. She did a Kaoru pretty wallie, and I did a Kenshin wall arent we cute XD. Clicky Linky to see the matching wallpaper. It is pretty neat! I just kinda wish that there was something on the left, like a firefly guiding him through the forest. Either way, still pretty neat looking! Great job on it! It looks fantastic starr! Really cool work! The moonlight looks fab and the bamboo is great. The painting/smudging/blurring is really well done. ah neat painting :) I like those bamboos (can't wait to see the tutorial on it ;) ). and the scan you've modified looks nice too, the style is consistent with the background. I like how you've got the shadow of the bamboo to fold along with his clothing too ^^ Lastly, I like those moonlight effects on the bamboo, but maybe there should be some moon highlights on his hair (and his clothes) as well. A M A Z I N G ! ! ! ! I'm really loving painted walls right now, and this is awesome! The moonlight turned out really nice and the bamboo does, indeed,look like bamboo. There's no bamboo where you live? *scratches head* I guess pretty much everything will grow in Oklahoma. oh wow looks really cool! Love the moonlight! Looks awesome. And good looking blood as well! great work! I'm really liking paint-o-rama's contest theme, Feudal Eras. Especially when the wallpaper is of my favorite anime; Rurouni Kenshin! XD I've seen 2 so far of RK and I'm in heaven with both of the wallpapers X3 Anyway, I love the work you did in this wall! I also like the battousai better than the normal kenshin as well. Before I go off track, great job and keep it up! OMFG IT'S MY HERO O_O! Gotta love night time settings,excellent work with the lighting ^-^. A very beautiful wall of Kenshin, and I can't believe you made the bamboo from scratch! They look g-r-e-a-t! Very well based composition, though i did like the color choices. HOT! i like when he's in his battousai form! does not make much days i saw the OVA and film.